Basic Baking Ingredients: What’s My Function? When I teach my quickbread unit I like my students to know the function of the basic ingredients they are working with. In order to do this, I like to do a mini-pancake demo made up of rounds. Each round adds a new ingredient to the mini-pancakes. Students must taste test the mini-pancakes during each round and try to figure what the purpose or function of the basic ingredient is and describe the pancake’s taste, texture and appearance. After sharing their guesses, students create a foldable of ingredient function notes and then apply it to the pancake demo in a follow-up review. What do nails, wood, screws, cement, cinder blocks, doors/windows and shingles have in common with flour, sugar, salt, fat, liquids, eggs and leavening agents? All serve a specific role or function in the project you are using them for and without them, problems might occur. Imagine building a foundation for a house with cinder blocks and you leave out the cement…what would happen? There are seven basic ingredients which include the above mentioned: flour, sugar, salt, fat, liquids, eggs and leavening agents. Set up the ingredients and equipment for the mini-pancake taste test. Make enough pancake batter for the number of students in your class and for five rounds. Students must taste-test a pancake from each round and complete the “Taste Test Form”, describing the taste, texture and appearance, along with what they believe the function of the ingredient(s) to be. After the taste test is over, ask students to share their descriptions of the function(s) of each ingredient based on the taste test so you can determine what they know or figured out. 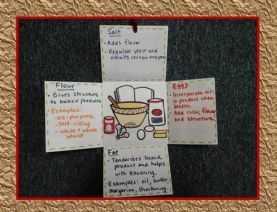 Then have students create the foldable tie book notes project (PPT directions are found below), using an animated Guide to Good Food site found here to find out all of the functions of the basic ingredients. See the lesson and photos for specific details. Finally, students will apply the foldable ingredient notes to the Mini-Pancake Follow-up questions. Hi! I love this ideas!!!!! Is there a place where I could get a copy or a link to your quick bead unit? I used this lesson, and it was wonderful! The students learned a lot and really enjoyed it. Thank you! How long was your class period? Were you on a block schedule? I have 55 minutes for my classes three days a week, & 50 minutes per class on the other two days. My class periods are 43 minutes long and I meet with my students daily.